I'm not going to get too deep into this. Pretty much every reliable source says it originated in the 1520s to 1530s (Swagger) where it originally meant to “to move heavily or unsteadily” then later becoming business lingo for promotional items (e.g. "free swag"), which suits the slang use of it today. "I have swag" = "I have stuff/items". For a word that can be found extended in Shakespeare books? 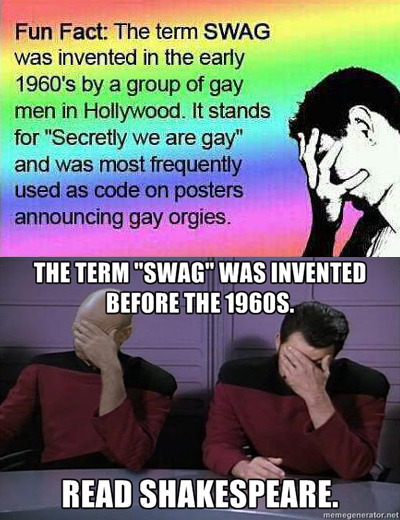 ("Swagger"). I know, not very strong sources. But hey, it's better than a Facebook photo.